On March 23, UHHRU’s pilot course “Human Rights Workshop” for students of the Institute of International Relations of the Taras Shevchenko National University of Kyiv was launched. The course includes lectures, practical classes and self-study assignments. Every Thursday, for one month, students will be getting acquainted with the practical work of human rights defenders in various areas. Everyone is welcome to attend, but the number of participants is limited. The workshop’s first day featured three topics. Oleg Martynenko, analytics head at UHHRU, spoke about the general work of human rights defenders. He also described the specifics and challenges of working under conditions of armed conflicts. 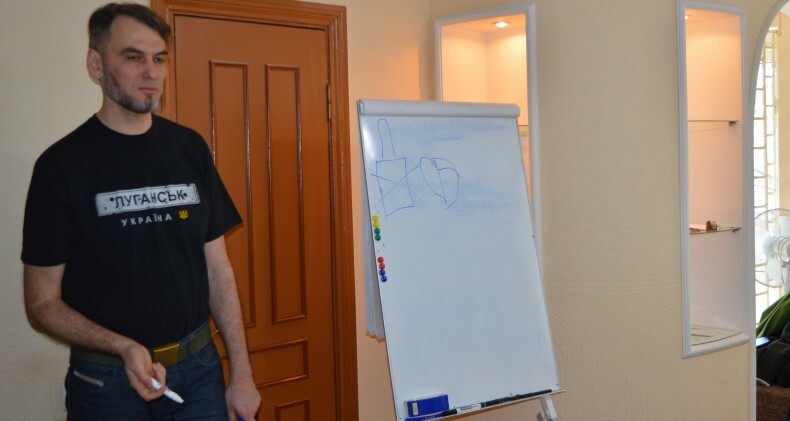 Oleksiy Bida, coordinator of UHHRU Human Rights Abuse Documentation Center, shared his expertise on organizing and conducting field missions to the ATO zone. He paid particular attention to the digital and physical security of monitors, as well as to the security of personal data of clients. The students welcomed the chance to try on body armor and learn the contents of personal first aid kits. Serhiy Movchan, lawyer of UHHRU legal aid center, spoke about collecting evidence of international humanitarian law violations and documenting human rights violations. He described what kind of evidence monitors gather to prove violations of international humanitarian law perpetrated in the conflict zone. Particular emphasis was placed on how the materials collected during monitoring visits can be used as evidence. After familiarizing themselves with the theory, the students were given practical assignments to help them test their newly acquired knowledge and demonstrate how accurately they are able to classify violations of international humanitarian law. In general, the lecture passed in a relaxed atmosphere, with the exchange of thoughts and experiences. This format received positive feedback from the students. Ivanna Karpeniuk summed up the meeting: “The most important thing to remember is, don’t be indifferent and remember that war crimes can not be justified by ideology or by belonging to certain political organizations. It is necessary to work with human rights organizations as much as possible, to give testimonies, and to help record the crimes”. We are in full agreement with her.